1- PERSIAN has been used in a variety of publications including cultural, scientific and diplomatic documents for centuries and, therefore, it connotes a very significant historical and cultural meaning. Hence, changing PERSIAN to FARSI is to negate this established important precedence. 2- Changing PERSIAN to FARSI may give the impression that it is a new language, and this may well be the intention of some Farsi users. 3- It may also give the impression that FARSI is a dialect of some parts of Iran and not the predominant (official) language of this country. 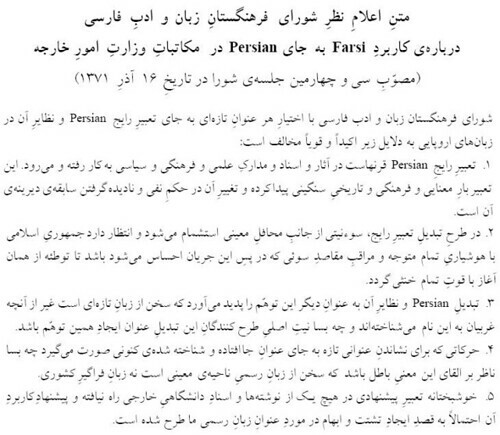 4- Fortunately, FARSI has never been used in any research paper or university document in any Western language and the proposal of its usage will create doubt and ambiguity about the name of the official language of our country.